A wealthy executive named Kingo Gondo (Toshiro Mifune) is in a struggle to gain control of a company called National Shoes. One faction wants the company to make cheap, low quality shoes for the impulse market as opposed to the sturdy but unfashionable shoes currently being produced. Gondo believes that the long-term future of the company will be best served by well made shoes with modern styling, though this plan is unpopular because it means lower profits in the short term. He has secretly set up a leveraged buyout to gain control of the company, mortgaging all he has. Gondo is forced out of the company and his creditors demand the collateral in lieu of debt. The story is widely reported however, making Gondo a hero, while the National Shoe Company is vilified and boycotted. Meanwhile, the police eventually find the hideout where Shinichi was kept prisoner. The bodies of the kidnapper's two accomplices are found there, killed by an overdose of heroin. The police surmise that the kidnapper engineered their deaths by supplying them with uncut drugs. Further clues lead to the identity of the kidnapper, a medical intern at a nearby hospital, but there is no hard evidence linking him to the accomplices' murders. The police lay a trap by first planting a story in the newspapers implying that the accomplices are still alive, and then forging a note from them demanding more drugs. The kidnapper is apprehended in the act of trying to supply another lethal dose of uncut heroin to his accomplices. Most of the ransom money is recovered, but too late to save Gondo's property from auction. With the kidnapper facing a death sentence, he and Gondo finally meet face to face. Gondo has gone to work for a rival shoe company, earning less money but enjoying a free hand in running it. The kidnapper reveals that envy from seeing Gondo's house on the hill every day led him to conceive of the crime. 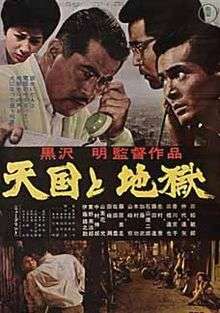 Tatsuya Nakadai as Chief Detective Tokura (戸倉), the chief investigator in the kidnapping case.